Quality 3/4” flat leather western browband style bridle with plain metal bridle rosettes. Adjusts on 1 side only, has conway buckle ends, & comes with matching split reins approx 5 1/2' long. Knotted brow western headstall with doubled & stitched leather, dark contrasting stitching, horsehair tassels, fancy etched "silver" buckles, keepers & tips, fancy etched conchos at bit ends, natural braided rawhide trim with black/white accents & natural horsehair tassels. Comes with matching split reins almost 7’ long with natural horsehair tassels, & braided natural rawhide reinforced water loops with leather string ties at bit ends. Great for show or pleasure. See matching breastcollar WBC25. Two tone leather western browband style pony bridle with latigo string ties at bit ends, comes with 3 1/2' split reins, 4 1/4” chrome plated curb bit & leather curb strap. Cheeks & browband are antique brown, rest of bridle is black. Browband style western bridle of 5/8" doubled & stitched soft nylon. Headstall adjusts on 1 side only, has conway buckles at bit ends, & measures 38" at largest & 29" at smallest adjustment with 11 factory punched & heat sealed holes. Comes with curb strap & 4 1/2" long reins with loop ends so easy to add snaps. Brand unknown. Cordura browband headstall features 5/8" Cordura nylon with a nylon web core, complete with 5” low port curb bit & matching curb strap. Headstall adjusts on 1 side & measures approx 42 1/2" on middle of 5 holes so can fit a large headed horse. It comes with 5/8" wide 7' long split reins. Great lightweight, synthetic bridle for trail or endurance riders. Clean & in like new condition. 3/4" 2 ply nylon browband style bridle that adjusts on one side with heat sealed holes, has conway buckles at bit ends & measures approx 32 1/2" at largest & 28 1/2” at smallest adjustment. Comes with 3/4" wide 2 ply almost 6’ long split reins with loop ends so easy to add snaps. There are a few dark smudges on rein loop ends, so this may have had snaps on but were removed. Brand unknown. Premium cowhide Buckaroo style browband headstall features teardrop cheeks with basketweave stamped design, "silver” dot accents, conchos & horseshoe stamped design buckles at cheeks. 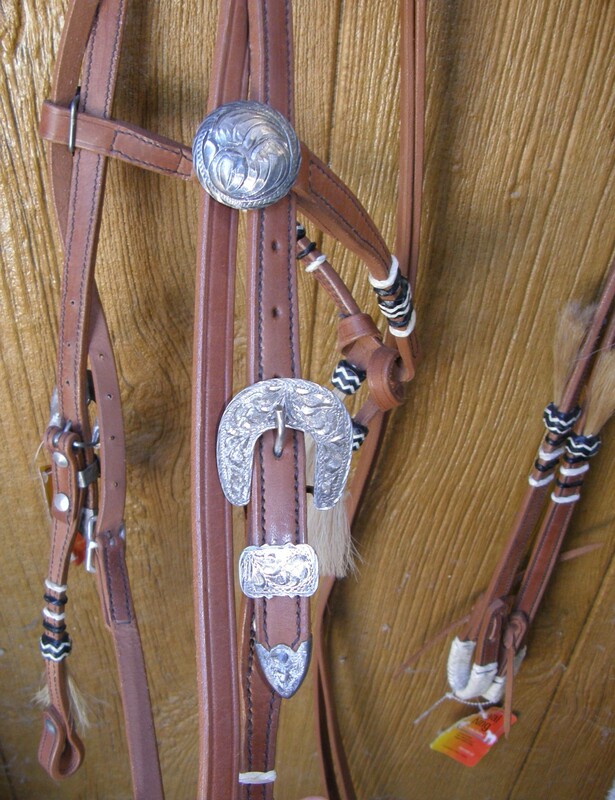 Comes with matching 5/8" wide 6’ long plain split reins with “silver” concho Chicago screw ends & sliding rein keeper. Soft quality latigo leather browband style western bridle with white stitching, adjustable on one side with 6 factory punched holes, latigo string ties at bit ends & comes with 4 1/2” chrome plated curb bit, leather curb strap & almost 5’ split reins. Headstall measures approx 30" at smallest adjustment but more holes could be punched. Minor rust on curb bit & minor corrosion on buckle, but bridle in excellent hardly used condition. Sliding one ear style western headstall with round braided red & black accented natural braided rawhide trim. Doubled & stitched leather with darkened & rubbed edges, white contrast stitching, & quick change loop & tab at bit ends on headstall. Sliding ear is round rolled leather with rounded braided rawhide accents on ear & cheeks. Headstall measures 39 1/2" at largest & 29 1/2" at smallest adjustment with 6 factory punched holes each side. Comes with matching 3/4” wide approx 7’ long split reins. Reins do not have any rawhide trim but do have white contrast stitching. Use for work, show or pleasure. Brand unknown but leather is good quality, possibly Hilason, Showman or even slightly better brand. Leather is supple & set was hardly used. Made of a synthetic material that combines the strength of nylon with the easy care of vinyl, Beta is particularly popular with trail & endurance riders, since the material requires no maintenance & can be subjected to virtually any conditions without being affected. Beta is composed of a nylon core with a vinyl coating. It is impervious to dirt & sweat, & will give you years of use with no maintenance required. The material stays supple in freezing weather & doesn't dry out or get brittle with age. Beta is durable & easy to clean, just dunk in a bucket of water, swish around & hang to dry. Fancy etched Chicago screws at bit ends on headstall & reins, double buckle crown for wider range of adjustments & comes with 7’ split reins. Excellent used condition, headstall is like new but reins have been chewed on by horse(see inset), both within 1st 9” of reins. Cut out bad section of reins to make look like new(& lose approx 1’), or use as is(strength is still there). Brand unknown. Rope noseband with leather wrapped nose on 5/8" leather browband style headstall & split cotton rope reins. Headstall adjusts on both sides with 5 factory punched holes & measures approx 36" at smallest adjustment. Comes with almost 13’ long 1 1/8" wide braided cotton rope reins that are soft in your hands. Nice set to use for training colts. Brand unknown. We removed reins to clean, so are not tied on in traditional bosal manner. Quality leather browband style western bridle light oil with contrasting white stitching, adjusts on one side only & has latigo tie strings at bit ends. Comes with matching 6’ long 5/8” wide split reins & 5” low to medium port curb bit with curb strap. Complete set up, ready to ride! Use for work or pleasure. Quality similar to Weaver or Tory. This double ear show headstall is crafted of doubled & stitched leather accented with "silver" ferrules on cheeks & sliding ears, fancy etched "silver" buckles, keepers & tips, has white contrast stitching, & rubbed & darkened edges. Both cheeks adjust & have etched Chicago screws at bit ends. Comes with matching 11/16” wide 7’ long reins. Great for your Western show horse! Beads make this a heavy bridle so reins will feel weighted. Brand unknown, similar to a Jacks bridle we had. Braided rawhide decorates this browband style western headstall with cheeks that adjust on both sides, etched "silver" trim/conchos on browband & fancy etched "silver" buckles. Doubled & stitched construction with darkened edges & Chicago screws at bit ends. Comes with matching 5/8” wide x 5 1/2' long split reins. Use for work, show or pleasure. Brand unknown but similar to Royal King, Showman, etc. Shaped ear style western headstall with engraved sterling silver buckles, conchos at bit ends, engraved stertling silver trim on cheeks & floral pattern engraved silver trim plate at bottom of ear. All leather is doubled & stitched, headstall adjusts on both sides, & comes with matching split reins. Headstall measures approx 43" at largest adjustment with 3 more holes on each side to make it smaller. Matching split reins are 5/8" wide x almost 7' long & have sterling silver buckle ends & 9 silver trim pieces on each rein. Age & maker unknown, should be a vintage piece, & is stamped with initials JRH on inside of crown & both cheek pieces, & reins are stamped on the ends Hand Crafted by Betty Doviak. Lovely set, in excellent condition, leather is supple with only some wear marks on cheeks from silver buckles & darkening of leather at rein ends. Sliding double ear style western headstall with fancy etched "silver" trim, buckles, keepers & tips, doubled & stitched leather with darkened & rubbed edges, white contrast stitching, & fancy etched conchos at bit ends. Headstall measures 38" at smallest adjustment with 4 factory punched holes on each side. Comes with matching 5/8” wide approx 6’ long split reins. Use for show or pleasure. Brand unknown but similar in quality to Royal King brand. Quality 5/8” black doubled & stitched harness leather browband style Western headstall with cheeks that adjust on both sides & Chicago screws at bit ends. 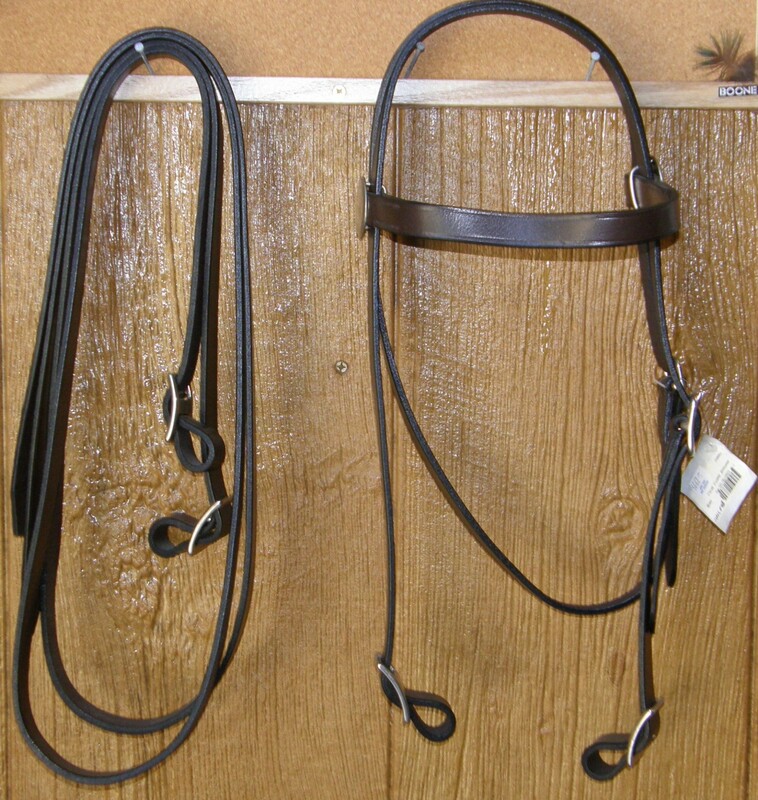 Comes with matching 5/8” wide approx 7’ long split reins with buckle ends. Great work or pleasure bridle, sturdy yet nice! Brand unknown but quality similar to Tory, Weaver, etc. Western browband style headstall with white contrast stitching, Chicago screws at bit ends & comes with matching 5/8" wide 7’ long split reins. Great headstall that adjusts on both sides. Reins are reinforced with a layer of rawhide on the inside at bit end, to promote less wear & make longer lasting. One of our tack shop buy outs, they came in with bit ends of reins flipped inside out & when we flipped them right side out, it caused leather to slightly crack on surface, but since they are reinforced & we oiled them, they will be fine. Browband style western headstall withscored & darkened edges, tear drop shaped cheeks that have a large leather rosette on each side & a shaped wide browband with banged tin "silver" trim. Cheeks adjust on both sides for a wide range of size adjustments with latigo string ties at bit ends. 12” browband & largest measurement is approx 34 1/2” with 4 more factory punched holes to make smaller on each side. This comes with matching split reins 1/2” wide x 46” long. Cute pony bridle, could be used for small shows or pleasure riding. Brand unknown. Nylon browband style western bridle made out of 3/4" doubled & stitched pink nylon with white overlay that has Mini Heart cutouts. Headstall adjusts on one side & has conway buckles at bit ends. Measures approx 31” at smallest adjustment & 35” at largest adjustment. Comes with matching 5 1/2' split reins with loop ends, easy to add trigger snaps. Browband style western headstall features 5/8" Cordura nylon with a nylon web core, adjusts on one side only, has Chicago screws at bit ends & comes with approx 6 1/2' split reins. Headstall measures 40" as adjusted on middle of 5 holes. Great lightweight, synthetic bridle for trail or endurance riders. Bit or curb strap are not included. Bitless or sidepull bridle with an X under the jaw, adjustable noseband, cheeks adjust on both sides, & comes with attached split reins. Very adjustable with 7 factory punched holes on each side so should fit a wide range of head sizes. 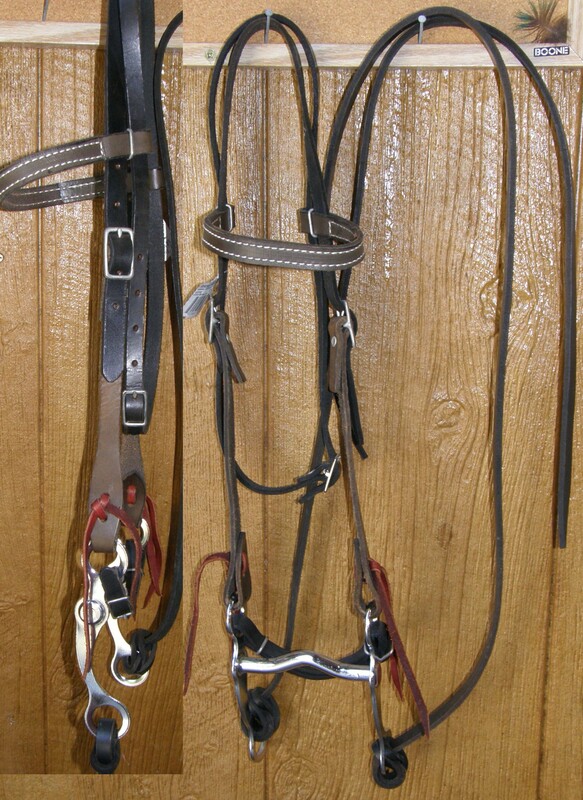 Synthetic bridles are made of Beta biothane which is washable & durable. This headstall has a square roller buckle on each side instead of the traditional rings for straps to run through. It comes with attached reins that were stitched in the center but owner took apart so they could use a running martingale, but easy to restitch or punch a hole & add a conway buckle. This set can be used English or Western. Excellent used, was used only a few times. Brand unknown, but similar to Nurtural Horse or Dr Cooks. Rolled leather browband style western bridle with single ply stitched flat crown piece that is adjustable on both sides, plain "silver" ferrules, floral design stamped on "silver" browband trim piece, & has Chicago screws at bit ends. No throatlatch. Headstall measures 41" at smallest adjustment & 47 1/2" at largest adjustment. Comes with matching split reins approx 6’ long. Leather is supple, reins had been tied so has a kinks in leather, ferrule beads have some rust on them, with others being very rusty, & 1 rein has a preofessionally sewn in splice near very end. Makes a nice trail or work bridle, Looks nice on Arabians or Gaited horses. Brand unknown but leather is soft & supple & drapes nicely in the hands. 5/8" wide doubled & stitched leather western sliding ear headstall that is adjustable on both sides with what looks like stainless steel buckles & has leather ties at bit ends. Headstall measures approx 40” as set on middle hole of 5 on both sides. Comes with split reins that are doubled & stitched for 1st 20” of reins, have fancy etched Chicago screws at bit ends along with spring snaps, & measure 5/8” x a little over 7' long. Quality soft leather that just flow in your hands. Headstall is stitched with dark stitching, the reins are stitched with light, so not an exact match, but both are nice enough for small shows or for everyday use. Brand unknown but similar in quality to Tory. Round braided browband style western headstall with cheeks that adjust on both sides with braided rawhide button stops, braided buttons with sliding braided rawhide keepers at bit ends, reinforced where bit sits with rawhide, & has a throatlatch. Looks like it is 4 plait leather. Crown & cheeks are made with 2 rows of 1/4" leather, & single row for browband, throatlatch is approx 1/8". Measures approx 40" as adjusted now in center adjustment with room to make smaller or larger. Comes with matching round braided split reins approx 1/4" wide, slightly over 7 1/2' long with trigger/scissor snap ends, & has a braided rawhide keeper & button trim. Maker & age unknown, but owner used on her Arabian many years ago. Leather is soft & supple, snaps are a bit stiff but work well. Has matching riata lariat, see LAR17. Buy both for $200. Bosal is natural colored rawhide with braided in headstall stops, measures approx 1" at widest spot on nose with approx 2 1/4" ball at base, is almost 11" top to bottom interior, 6 1/4" side to side interior & is flexible. Bosal is on a heavy duty harness leather browband style western headstall with leather throatlatch, & doubled & stitched browband. Comes with 6 1/2' long 1” wide x 1/2” thick flat braided cotton reins that are soft in your hands. Great work set to use for training colts. Brand unknown but quality leather. Shaped one ear style western bridle with doubled & stitched crown piece with white contrast stitching, single ply cheeks & throatlatch, & has Chicago screws at bit ends. Headstall adjusts on both sides & measures 42" at largest & 37 1/2" at smallest adjustment. It comes with 5/8" wide x almost 7' long matching split reins. Leather is supple & reins drape nicely in your hands, but some surface cracks at bit ends on headstall & end away from bit on reins. Still a great working or trail bridle. Brand unknown. Double sliding ear western headstall features fancy etched "silver" buckles, keepers & tips, fancy etched conchos at bit ends, natural braided rawhide trim with brown accents & natural horsehair tassels. Doubled & stitched leather with white contrasting stitching. Comes with matching split reins almost 8' long including over 6” long natural horsehair tassel at end. Braided rawhide reinforced water loops with leather ties at bit ends. Great for show or pleasure.